It’s finally time to bring the Play Drawer to YouTube for once! I’ve been wanting to play with masking fluids (aka friskets) for a while, and have been collecting a few. I put them to the test in this video. Supplies are in the doobliedoo. Note that there are ways around some of the bloop issues shown – but I wanted to use the products as purchased before adapting – so stay tuned for an update soon on some other things I’m trying that are already meeting with more success. If you can’t see the video, click HERE to see it on YouTube. A few other things to share…. I was humbled by THIS post. I get so excited when people are inspired by what I put out there! Don’t forget the 25% off sale on Copics HERE, just use the coupon code Markers. Shop by Nov 14! 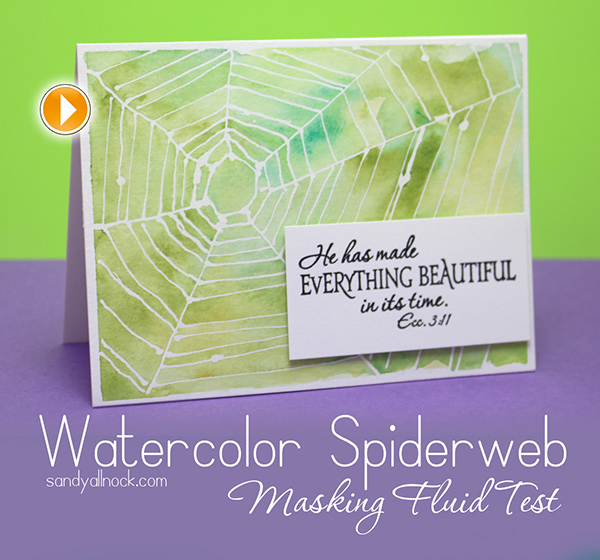 Watercolor class next Friday (Nov 7) in WA and Nov 23 in MD will be WAY easier than this spiderweb. LOL. Class details HERE. Remember the OCC Copic Class is always open – if you missed it earlier, it’s not too late to go learn a ton. Click HERE for that. INCREDIBLE WHITE MASK 2 oz. INCREDIBLE WHITE MASK 4.5 oz. Miskit Liquid Frisket Mask 1.2 fl.oz. • Incredible White Mask 2 oz. • Incredible White Mask 4.5 oz. 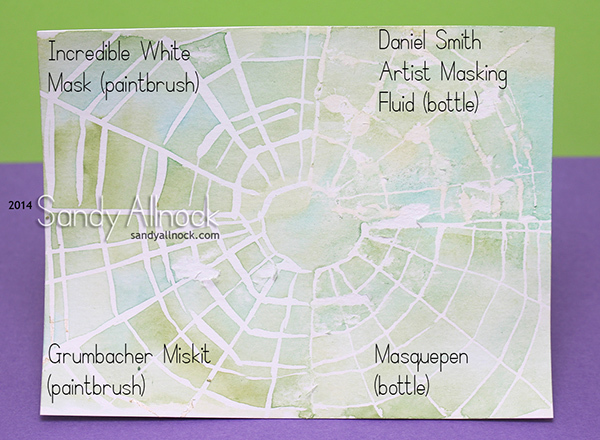 • Miskit Liquid Frisket Mask 1.2 fl.oz. Thank for the comparison!! Very instructive!!! Your spider web is totally realistic!!! Thank you for your tutorials Sandy. I bought a Winsor and Newton masking fluid earlier in the year (thought I might need this one day) but haven’t used it yet. I’m glad I waited, as you have ponted out a few pitfalls. Thanks also for the spiritual content in your videos – puts things into perspective. I am familiar with frisket from my painting days. My best friend is a watercolor artist, so I learned from her. Always great to be reminded of products that can be used to create cards. Thanks for your wonderful teaching Sandy! You are always a great inspiration. What a beautiful card and sentiment! Thanks for doing the comparison of these products. I have not purchased any frisket yet, but will definitely take your advice into account when I do. You always teach me so much! I also appreciate the other commenters as they share their ideas with us. You have great followers! That’s a testament to the great person you are, as you inspire all of us to be our best! Learned something new today. That verse works great with the spider web. Thanks for sharing your talents with us. Love the card and wanted to find out what the precious and dooblido was? Hi Sandy. I found if you get an “Incredible Nib” to use with the bottle frisket you have better control. Also I pour only a little bit into an old plastic film can when I am using it. Keeps the stuff in the bottle from thickening up. Have a great day! I had absolutely no idea what frisket was before I watched your video but your video was so informative. Now I know! I might add it to my wish list. Looks like something I would enjoy trying. I am always learning so much from your artistic talents in addition to great card making. Thanks for your video. Glady I am not the only one that has hard time waiting for things to dry. Your card was lovely, glossy accent dew drops would be cool on the spider web too. It is so strange that you would you masking fluids! I’m not a student of art and had never heard of them until I saw a video less than a week ago. You now make three times I have seen someone use masking fluids! The funny thing is, the first video I watched wasn’t new and I hadn’t heard of the person before, it just looked interesting, and it was ☺ Thanks for helping to widen my scope! Thanks fortune demo. You make my wallet cry with your enabling ways. Lovely card. Amazing technique. Thanks for sharing! Oh and you can buy those Fine Line bottles empty on Amazon or at Hobby Lobby! I put Glassy Accents in mine and it does not plug up! Hi Susan, Is your name Susan? Your name is partially covered by your photo. Thanks for the tip. I will put Glossy Accents in the spare bottle. I have filled one with Multi Medium Matte and it works super. Not too thick to squeeze out of the 18 gauge tip. Hi Cheryl that is the size I have and I put a half big bottle of Glossy Accents in it! No clogs! Amen to your a Godly card! Thank you for the comparisons! Do the fluids really smell? I didn’t notice any smell at all, but there’s enough comments about how stinky the fluids are that I might have to go do a sniff test later. lol.